For over twenty years, SPI International has been one of the main distributors of films and television programmes in the international market. SPI currently distributes 16 TV channels on four continents and offers an attractive library of VOD content. The channels of SPI International reach more than 25 million subscribers in total. SPI uses the latest technology, so that viewers around the world can enjoy easy access to the offered products. 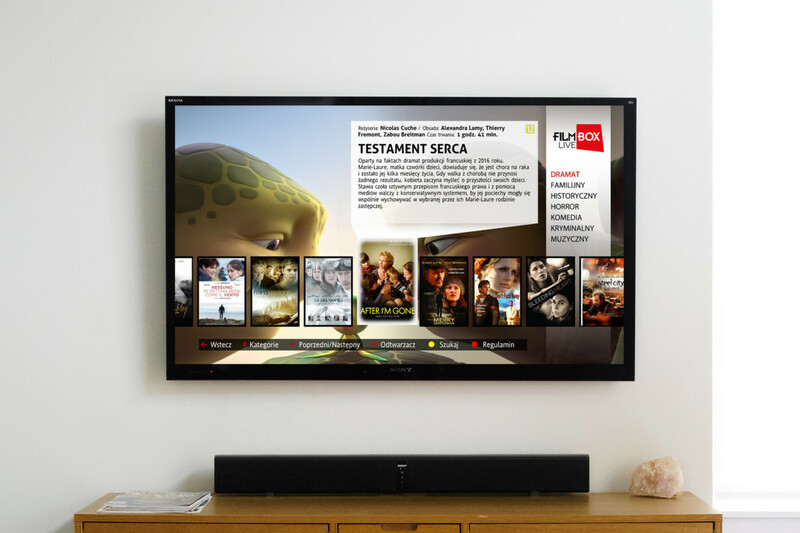 The Filmbox Live app is a service for watching TV channels live and providing immediate access to VOD content on any device connected to the Internet. The app has over 100,000 users. A Filmbox package must be purchased to access the app. This can be done through the set-top box. The customer pays for access together with the payment for the TV/Internet. We used our transcoders and PlayReady DRM protection features for converting video files. We added an advanced search facility and categorisation of metadata containing information about films. In addition to the delivery of technology, our task was to design the user interface and graphics. We wished to ensure that the appearance of the app on set-top boxes went hand in hand with its usability. We have categorised films, launched a search engine, and provided tools to filter films by title and director or actor’s name.